Article by Marshall Titch, candidate in Master of Financial Mathematics (May 2019). 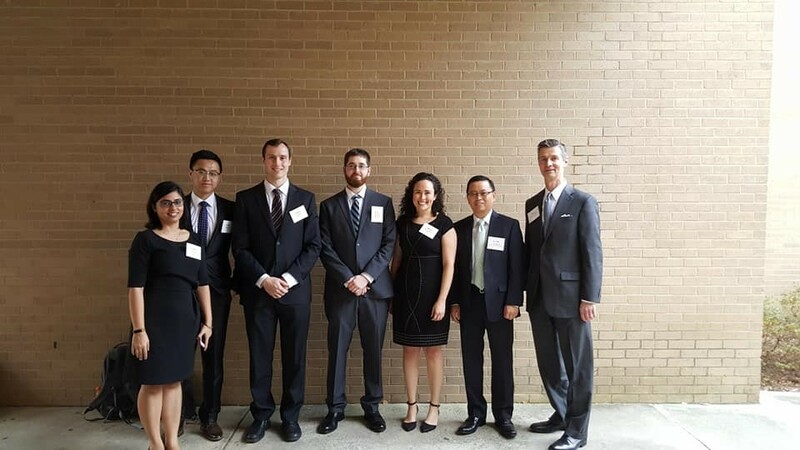 On 17 February 2017 at UNC Greensboro, the NCSU Master of Financial Mathematics team consisting of Pengfei Xiong, María Calderón, Ratika Kapoor, Kenny Kalsch, and Samuel Knox set the standard for professional excellence by presenting their findings from equity research and financial analysis on Primo Water Corporation (NYSE: PRMW) as part of the local level CFA Institute Research Challenge competition. The local level competition included teams from Appalachian State University, Elon University, and UNC Wilmington. 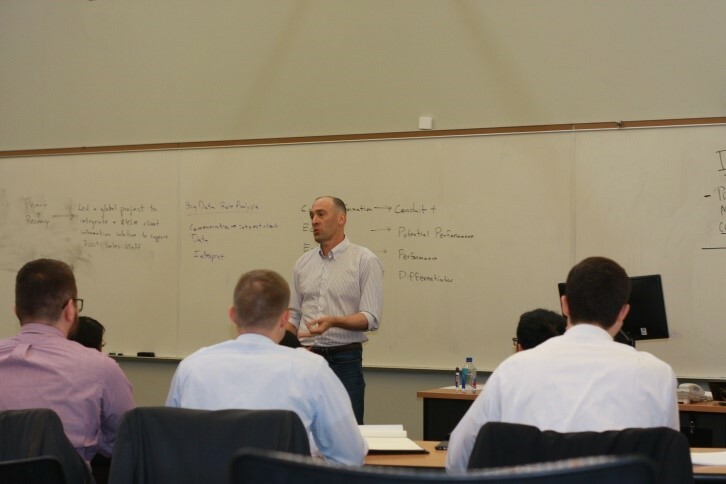 Overall, the competition provides students with hands-on mentorship and intensive training in financial analysis before culminating with their written and oral presentation of analysis results and their buy, hold, or sell recommendation to a high-profile panel of judges consisting of heads of research, portfolio managers, and chief executive officers from some of the world’s top firms. Over the course of 3-4 months, given mentorship from Dillon S Harris Jr., CFA, Portfolio Manager Senior Vice President from US Trust Bank of America Private Wealth Management, the NCSU team conducted equity research and analysis to conclude a hold recommendation on Primo Water due to a variety of risk factors that did not seem to fully offset the potential upside in the near term. As a result of their efforts, the NCSU team gained incredible experience, and personal growth relevant to their career field. The CFA Institute Research Challenge is a global competition that tests the equity research and valuation, investment report writing, and presentation skills of university students. Article by Erica Caines, candidate in Master of Financial Mathematics (Dec 2018). On February 23rd, 2018 John Collison presented on building a better resume in the Financial Math career seminar (FIM 601). With a Ph.D. in Educational Leadership, John’s educational background also includes a bachelor’s degree and two master’s degrees in Curriculum Design and Organizational Dynamics. John currently works as Global Director of Talent Development in Genworth Financial and has over 20 years of work experience in the field of leadership development and talent acquisition. John began his presentation by telling us about important elements that a good resume should have. As we are students in the Financial Mathematics program, it is essential to have performance improvement metrics / numbers in our resume to convert our intangible skills into something tangible. In other words, each bullet point of our professional experience and projects should include a result instead of a process. The “3 second rule” says that, on average, a recruiter only spends 3 seconds glancing over a candidate’s resume. Our resume should be such that, in that short a time, we make the recruiter aware of our results. In an interview, we can always explain what we did, or how we got to that result. I noticed that I had not quantified any results on my resume, and so I changed my resume as soon as I got home. Throughout his presentation, John provided us with humorous examples of “bad” resumes, which made us realize that ours needed a lot of work. Overall, I found his presentation to be insightful, helping many of us improve our resumes to further our career search. Article by Samuel Knox, candidate in Master of Financial Mathematics (Dec 2018). 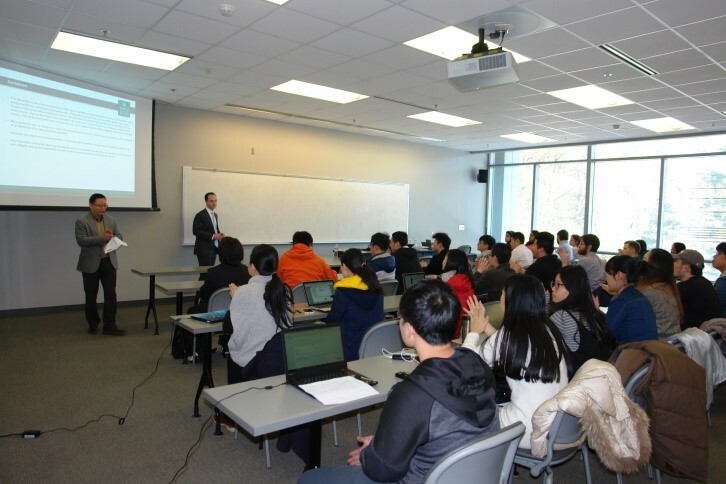 On February 9th, the FM students welcomed guest lecturer Craig Sullivan, the Director of Fixed Income at Franklin Street Partners in Chapel Hill, NC. The lecture was a self-encapsulating look into the core and opportunistic features of the fixed income market. 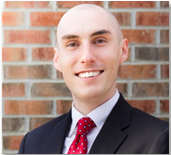 After graduating from North Carolina State University with a Bachelor of Science in Psychology in 2004, Craig became a portfolio manager for Merrill Lynch. Since then, he has received prestigious designations as a CFA and a CAIA. Craig joined the team at Franklin Street Partners as a Portfolio Manager before becoming the Director of Fixed Income in 2016. As director, Craig is responsible for portfolio management in core fixed income, opportunistic credit and preferred securities strategies. Being an expert in the field of fixed income, Craig has also written several papers on Contingent Convertible bonds. His knowledge of markets is met with the skill to identify trends in order to make salient and insightful financial decisions. Bringing such insight to the classroom, the FM students listened while Craig flipped through current time series data, ranging over the past 5 years, describing trends and indicators which are used daily at Franklin Street. He made critical inferences about inflation in the United States suggested by increased wages, optimistic market sentiment, and decreasing unemployment rates. Given these inferences as well as new political administrations, Brexit negotiations, and the slowdown of Chinese growth in early 2017, the market has not quite reacted as expected. “Despite uncertainties entering 2017, investments were treated to a ‘Goldilocks’ environment with above-average global growth, below-average inflation and record-low levels of realized volatility across financial markets”, Craig declared. Finally, Craig used the U.S. treasury yield curve to conjecture on a potential market recession. “Investors are not receiving much compensation for taking on more risk by extending maturity or taking on downgraded investments. The yield curve has flattened, and credit-spreads are near post-crisis lows.” With such uncertainty, however, BBB rated bonds have been the best performing and should continue to be coming into the early months of 2018. 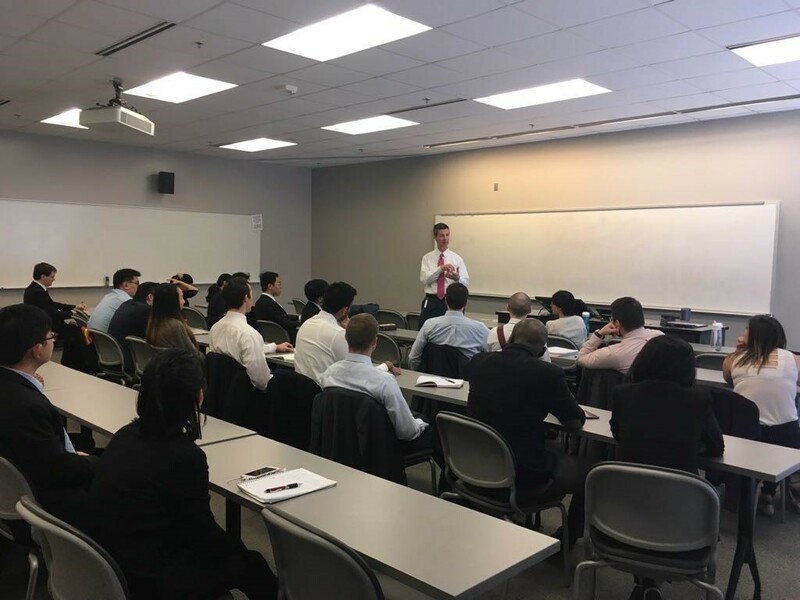 Overall, the FM department was fortunate to have Craig Sullivan on campus as the students gained plenty of insight into fixed income markets from an external perspective. Fixed Income is a possible path for this cohort after graduation and many are inspired by the chance to manage risks in these markets. Any alumni from portfolio management should be encouraged to come and speak with us on their insight whenever available. Article by Deepika Chaudhry, candidate in Master of Financial Mathematics (Dec 2018). Article by Yuxiang Huang, candidate in Master of Financial Mathematics (Dec 2018). The Financial Math career seminar (FIM 601) is one of the most interesting courses in the MFM program. Each week, an experienced industry professional is invited to the seminar to share about their work experience, to give talks on relevant industry topics, and to offer career advice. A CFA charter holder, Dillon S. Harris, Jr., CFA was one of my favorite speakers this semester. He is a portfolio manager, senior Vice President in U. S. Trust, Bank of America Private Wealth Management. We thoroughly enjoyed his conversation with the class where he shared his own stories and some interesting examples. During his presentation, he walked us through his own experience of hunting for jobs in the 1980s and also during the economic crisis of 2007-08. His presentation not only gave us some valuable advice on searching for our dream jobs, but also essential practical skills regarding interviews. For example, it is always good to showcase our determination to join the interviewer’s team. 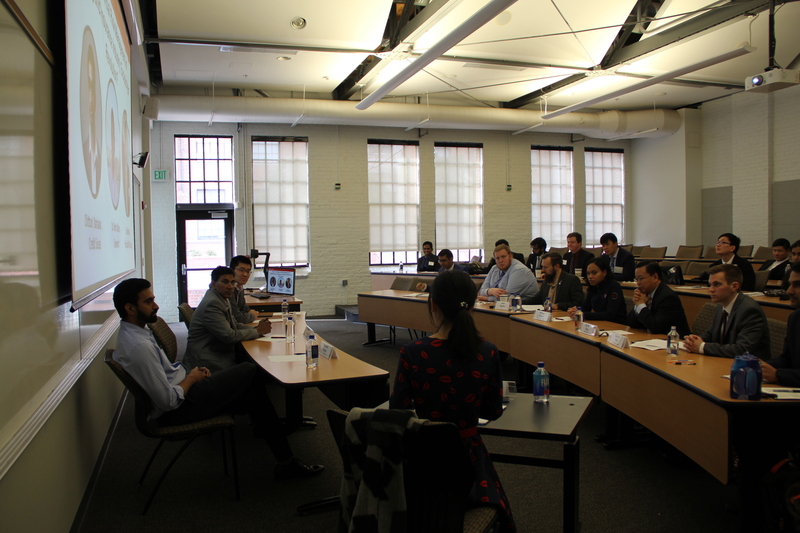 He also mentioned it is a good practice to ask questions from the interviewers. We can ask questions related to the interviewer’s experience or related to the interview; it’s always to our benefit to take an interest in professionals’ experiences. He recommended that we set up informational interviews with industry professionals as often as possible. Statistics show that networking is key to job success; informational interviews will help us in building our professional network. I personally found his talk to be very valuable and informational. Taking his advice, I also tried to set up informational interviews with some industry experts. Though it may not directly give me a job opportunity, I am confident it will help me know more about the finance industry and skills that are essential for success in getting a job. Article by Yining Huang, candidate in Master of Financial Mathematics (May 2018). Imagine you want to rob a bank successfully. What’s the first thing you need to do? To pull off the robbery without being arrested by a police officer, the first step is to write down your strategy. If we check every detail of the method, we could find it contains everything that a trading strategy should have: How and when to enter the market, when to exit the market, and so on. There is one important principle in the plan: pull out of the bank at the scheduled time regardless of how much money was looted. This is similar to the idea of a trading strategy: you should execute your strategy strictly no matter how much you make or lose. A negative result does not necessarily mean that you have a bad strategy. However, if you do not execute your strategy rigorously, you cannot measure whether your strategy is good or bad. With the detailed plan, Baron Lamm and his group stole more than a million dollars in nearly 30 years. They finally failed because the black swan event happened. When they finished one robbery and escaped, the car blew out a tire. After seizing several other cars with various issues, they were eventually surrounded. Article by Kenneth Kalsch, candidate in Master of Financial Mathematics (May 2018). When someone mentions the stock market, the image of a bustling trading floor in the middle of New York City comes to mind. There’s lots of yelling, a bell ringing every now and again, and lots of TV screens displaying lots of numbers. People also tend to correlate mathematical ability with trading success, which simply is not the case. In regard to trading, math only really starts to see importance in large scale settings. An example might be managing a $10 million portfolio and figuring out the position you need to take to minimize the risk of losing money. In general, an individual who wants to get into trading isn’t going to have large sums of money they’re willing to invest, so this process known as hedging isn’t a realistic option. Chances are someone starting out might be willing to invest a few hundred dollars, and to be honest, there isn’t much you can do quantitatively to improve your chances of profit. The big question is, “What exactly can I do to be more successful at trading?” The simple answer is to be informed. Reading the news, especially on financial websites, can be enlightening. For instance, let’s look at the situation going on with Nvidia. Two weeks ago, an Uber using Nvidia’s driverless technology was involved in fatal accident in Arizona. Today, Nvidia announced that they are halting public road testing and there was a 7.8% drop of value in their stock. Not only was Nvidia’s share price affected, but Tesla, another company pioneering in driverless cars, saw a drop of 8% (BBC). A smart trader would start paying attention after hearing about the accident and thinking about what could happen. How likely is it that restrictions could be put on autonomous cars after the accident? Who would enforce the restrictions? Could a ban be possible? How does the public feel about the brand? The more informed one is about the situation, the better judgement they can make of what will happen. This information should be used to leverage the position. If the information points to a negative lasting effect, it might be the best decision to sell. If the company will bounce back after the incident, it’d be a good idea to wait for the stock to dip and buy. Tesla’s stock reached a year low today but is almost always shown in a positive light. Maybe it’s time to buy. In short, trading strategies can be formed and executed without the use of quantitative information. We have all heard that knowledge is power, and it is no different when it comes to the stock market. With all of the sources of information available today, being a successful trader isn’t out of reach. All it takes is a little patience and dedication to staying informed. Article by Chongwen Sun, candidate in Master of Financial Mathematics (Dec 2018). Since Alpha Go’s victory over one of the strongest human Go players, artificial intelligence has become much more popular in almost every industry. Some financial analysts and traders imagine that an “Alpha Go” could beat the market in the future. One technique used in Alpha Go’s software, Reinforcement Learning, catches some people’s attention. Reinforcement Learning (RL) is different from other machine learning tools in that it’s not a pure forecasting method. It can learn continually through action and outcome with a final suitable suggestion, not just a prediction. Therefore, this kind of method is more in line with the needs of quantitative transactions. All RL methods can be classified into model-based or model-free. The difference is whether your model can understand its working environment. Obviously, in trading, it’s more practical to first “introduce” our model to the finance world. One more advantage of model-based is that a trader can first introduce all possible outcomes to the machine, so that it has the competency to deal with anomalies. To implement RL in trading, we consider information such as price, news, public opinion, interest, fees, etc., as the environment. The AI’s utility function is set to the maximization of profit or minimization of losses. Along with trading as its action and factors as its observations, stock trading can be embedded in the RL framework. In theory, we acknowledge the concept of Markov processes as a useful tool in stock trading. However, we can never get all the market states at one time because all data we could acquire and observe is just a very small part of the market environment. So, from my perspective, the most probable area in which to implement RL theory is high-frequency trading. Compared to longer-term trading, short-term trading (with frequency one day or less) is affected less by outside information. Thus, we can use RL to give trading suggestions several minutes in advance based on data just within the stock market. Also, the cost to train the model for a period of minutes is far less than the cost to train it for a period of several days. Reinforcement Learning, combined with deep learning, opens up a new path for automatic trading. This method still needs a lot of effort and improvement before it can be fully applied. 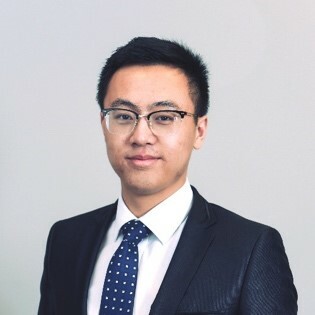 Article by Pengfei Zhao, candidate in Master of Financial Mathematics (Dec 2018). In the Financial Math program, we value the idea of putting the concepts we learn into actual application. One way to accomplish that is through doing projects, and we are constantly offered various projects to work on. Even as a first-year, I have already worked on many of them. At the beginning of the first semester, a team of four students, including myself, was formed to tackle a project called Elastic Asset Allocation (EAA). EAA is a fairly new method used to build an investment portfolio. In the little more than one-month time window we were given, we designed a VBA application in Excel that implemented the EAA method, and we managed to find out the optimal share for each asset. Our optimized portfolio performed better than the S&P 500 index. Another big project I got my hands on was called the Comprehensive Capital Analysis and Review (CCAR) for banks. The CCAR essentially is a stress test for bank holding companies. We spent several months to clean data and build our regression model through the use of SAS. In the end, we evaluated banks’ conditions under different stressful scenarios. The most recent project I have been working on is the Bloomberg Trading Challenge. This one comes with a lot fun and freedom. I look forward to coming up with a stock portfolio that has the highest Sharpe ratio by the end of this month. Through completing projects, we have certainly gained experience, and often, a taste of accomplishment. Article by Joshua Johnstone, candidate in Master of Financial Mathematics (Dec 2018). As hopeful professionals diving headfirst into the job hunt, we are often inundated with advice from every angle: how to dress, which skills to develop, how to tailor our résumés, and so on. Perhaps the piece of advice that we hear most often is the all-too-familiar, “Work on your communication skills.” But what exactly does it mean to have “communication skills?” What steps can we take to become a better, more confident communicator? It isn’t entirely clear where to begin. With this publication series, I intend to provide a starting place on the path to becoming an expert communicator in the business world. I will direct these articles primarily toward international professionals for whom English is a second language, but even if you happen to be a native speaker, I encourage you to read on! It never hurts to brush up your skills. Being well-spoken is the most surefire way to garner confidence from others. A few of the topics I intend to cover include the basics of speech (volume, clarity, tone, etc. ), grammar (common mistakes, formal versus colloquial structures), and written communication (writing emails and reports, networking). In addition, I will, at some point, include an article containing pronunciations, idioms, patterns, and humor unique to the English language, dedicated specifically to non-native speakers. Whether you, gentle reader, are searching for a job and want to nail your next interview, or if you already have a career and wish to convey your ideas more effectively to your colleagues: read on and become a more confident communicator. It may seem odd for me to include a section on “the basics;” after all, you are reading this article in English – surely you have a grasp on the basics. Well, as it turns out, speaking in English (and in any language) is a nuanced endeavor. Many aspects of speech that may be second-nature to a native speaker can be strange and uncomfortable to others. For that reason, I will cover a few of those aspects in this primary chapter – beginning with the single most important quality of a good communicator. Some people have trouble pronouncing certain words or sounds. Others may talk too fast or too slow, or too quietly. Regardless of these issues, all of those individuals could still be excellent communicators. The one defining difference in well-spoken people is that they have confidence in themselves. As cliché as it sounds, you have to have self-confidence in order to be an effective speaker. Some may argue that pretending to be self-confident is enough to get by – put on a brave face and “fake it until you make it.” On the contrary, feigned confidence will never be as powerful as genuine confidence. When you walk into an interview, you are much like a concert pianist walking onstage to perform for an audience; you have something truly unique and incredible to show everyone. You have what it takes to get that job, so you have every reason to be truly confident. As easy as it is to say, “Be confident in yourself,” it’s quite another issue to do so. Developing self-confidence is not an overnight process; you must dedicate yourself to it every single day. Some ways we can teach ourselves to be more confident include stepping outside of our comfort zones, allowing ourselves to be vulnerable, and setting short-term, reasonably achievable goals. It’s a difficult thing to do, but self-confidence is 90% of the battle when it comes to communicating. Another way to become more confident in your communication is to practice on and improve the way that you speak. To that end, let’s get into the more technical side of speaking, starting with clarity. Clarity, which we strive to maximize, refers to how well our speech can be understood by others, and it is closely tied to volume, speed, and enunciation. We would also like to have firm control over the speed of our speech. Talking too slowly tends to cause an audience to disconnect from a presentation and talking too fast leaves audiences struggling to keep up. Almost always, though, the problem is speaking too fast. Again, this is closely connected to nervousness, which causes us to talk faster than we realize. When speaking, remember to pause every sentence or two for a moment, become aware of your speed and volume, take a deep breath, and adjust accordingly. No reasonable audience will ever judge you over the occasional short pause. The last aspect of clarity is enunciation, which is the ability to pronounce words. Usually, being aware of your speed and can also have the effect of improving your enunciation, since talking too fast can reduce the sharpness of your words. Remember that English speech, as with most languages, is comprised of consonants and vowels. Nine times out of ten, the issue with enunciation has to do with consonants. Try speaking a few words, like “backpack,” without the vowel sounds – just speak the consonants sharply and clearly. Even without vowels, you can often still understand the words. Always keep your consonants crisp! A “sentence filler” is a word, sound, or phrase inserted into our speech that does not contribute to the thought being conveyed. Some familiar perpetrators are “um,” “eh,” and “ya know,” and they often appear when we’re trying to think of the next thing to say. Since they do nothing to enhance your spoken communication, their usage should be reduced. The way to get sentence fillers out of your speech is simply by becoming aware that you’re using them. Listen to yourself when you talk and try to catch yourself when you use a filler word. There’s no need to be upset with yourself for using them, simply acknowledge it every time you do. Soon, you’ll find yourself using fillers less and less. Closely related to sentence fillers are “ticks.” Many of us have speech habits that are all but unaware to us, whether it be the infamous “tongue click” before every sentence, fidgeting with a pencil, or scratching the neck. It can be helpful to find a friend to practice with whom to find out if you have any nervous speech habits, then you can work to reduce them using the awareness method described above. Body language is essential to a successful conversation. Your physical behavior while talking to someone speaks volumes about your current feelings. Consciously or otherwise, people do judge you based on these behaviors. Crossed arms, slumped shoulders, and torso pointed away from your counterparty are all behaviors associated with being “closed off.” This type of body language may invite others to think less of you, or that you do not care for them. This, gentle reader, you do not want. Instead, invite yourself to be vulnerable. Open your posture, keeping your chest up, back straightened, and arms relaxed. Do not stiffen yourself, but merely relax upward and outward, instead of downward and inward. You will find that maintaining a relaxed but confident posture will encourage others to trust in you. Your vulnerability, while difficult, will be rewarded with confidence. Besides posture, another aspect of body language is, of course, hand gestures. There is an endless debate over which gestures are appropriate, how often to use them, and so on. But again, I encourage you to seek out a friend with whom to practice and receive feedback, or to record and critique yourself. Ideally, hand gestures are not even noticed by your audience; to that end, err on the side of using too few. Try to reserve your gestures for when you say something important or emphatic and use gestures to drive home your point. The final topic of this chapter is one that native and foreign speakers alike have the most trouble with. Most everyone is aware that an upward pitch inflection is used to indicate a question. Answering a question with an upward inflection indicates that you yourself are asking a question and are therefore unsure of your own answer. But this is only one example of how tone and pitch affect the way our speech is interpreted. Ah, but it is necessary for me to define terms before I go throwing them around. “Pitch” refers to how high or low your voice is as you speak. Men generally have lower-pitched voices than women, but you shouldn’t concern yourself with the pitch of someone else’s voice. Rather, you should concern yourself with the pitch variations of your own voice. How you vary the pitch of your voice gives people information about what you mean when you speak. Those whose native language is Chinese (or a similar language) typically have a very deep understanding of vocal pitch, as pitch inflections are built into the structure of their language. One word that sounds exactly the same can mean something completely different when spoken a different way. Western languages do not have this characteristic. “Tone” is somewhat more challenging to define. Typically, “tone” refers not to what you say, but how you say it. In that respect, pitch is an integral part of tone. However, many other nuances of speech feed into tone. Tone is the way that someone listening to you can determine if you are being sarcastic, matter-of-fact, or deadly serious. If I were to say the following to you, “Your mother is old,” it makes a large difference how I say it. Certain variations of “your mother is old” may make you laugh, while other variations may get me punched square in the jaw. Tone and pitch take diligent effort to perfect. In an interview setting, you want to use a tone of voice that transmits confidence, friendliness, and enthusiasm. There is a tendency of international students (and indeed, many native speakers) to get comfortable using only one tone of voice, and that tone is the one they use for every situation. And to that I say, do not get comfortable! Explore the full range of your voice. Do not be afraid or timid but be bold and expressive. In closing, I risk repeating myself as I ask you, gentle reader, to commit to being uncomfortable. No one (and I do mean no one) walks into an interview without some discomfort. But the difference between a successful communicator and an unsuccessful one is the following. The unsuccessful communicator is subject to his or her own discomfort. He or she allows discomfort to stifle any semblance of personality or creativity. The successful communicator not only accepts but embraces his or her discomfort. Only through discomfort do we grow as communicators, in character, and in so many other ways. So, until next time, be uncomfortable. Article by Tianshu Yuan, candidate in Master of Financial Mathematics (May 2018). In most trading strategies report, people deliberately or unintentionally report in-sample performance or statistics without out-of-sample performance. This is criticized by most people because this problem is known as “overfitting” in statistics or machine learning background, which means that when your model/strategy works fit the data too well and capture most of data’s noise instead of pattern. In strategy building and testing, in-sample can be seen as “training phase”, out-of-sample can be seen as “validation phase” or “testing phase”. People sometimes do “one-shot-testing’, i.e. only testing their model on test data once, to avoid overfitting problem. In community of statistical learning, people contribute many methods to deal with overfitting problem. However, such methods do not work well in strategy testing because of several reasons. First, these methods often require explicit point forecasts and confidence bands over a defined event horizon in order to evaluate the explanatory power or quality of the prediction. Second, even if a particular investment strategy relies on such a forecasting equation, other components of the investment strategy may have been over fitted, including entry thresholds, risk sizing, profit taking, stop- loss, cost of capital, and so on1. To deal with back-testing overfitting, Dr. Bailey [X] proposed a method to analyze back-testing procedure. In his paper, he assumed that a strategy’s return follows a normal distribution, and researchers pick parameters that has the highest Sharpe Ratio (SR), notice that other performance measure works under his framework as well. By central limit theorem, the SR estimators will be normally distributed. And therefore, the maximum of n SR estimators will follow a Gumbel distribution, which has an explicit formula for its expectation. So, under the assumption that strategy’s return actually has zero mean, you can find out how high in-sample SR you can get by this formula. This formula reveals the relationship between the numbers of independent trials (back-testing), the back-testing length (in years), and the expectation of highest in-sample SR ratio. By looking at the formula, one can find that to prevent overfitting, it’s very important to increase the length of back-testing if one wants to increase the number of trials. Based on the formula, Dr..Bailey proposed the minimum backtest length required to prevent back-testing overfitting. In conclusion, the take-away of this paper is that it’s very easy to get overfitted by doing many trials on in-sample data and increase the back-testing length when increasing the number of trails. 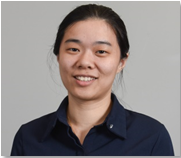 Article by Xiangqi Ling, candidate in Master of Financial Mathematics (Dec 2019). What might be the reason that Boeing experienced two air crashes in 5 months on its 737 Max 8 and Max 9 models? And what will be the consequences? After the second air crash on Boeing’s model 737 plane, investigators conjecture one innovative safety system did not respond correctly, and this false reaction contributed to the air crash. The Boeing company built a system to limit the speed of the plane. Unfortunately, sometimes the system would incorrectly lower the head of the aircraft to limit the speed. In the recent air crash, such actions stopped the pilot from bringing the plane back. So, while the pilot was trying the lift the head of the aircraft, the system kept preventing the lift. This is what the experts are thinking right now; that is, the safety system fails to consider where the head is pointing. Most European and Asian countries begin to ban or suspend this model. Furthermore, the number is still growing. In China, model 737 almost would almost monopolize short and middle range flight in the future. If this model were utterly suspended, Boeing may permanently lose the fastest growing aircraft market in the world. Plus, the American president Trump did not stand with Boeing. Instead, Trump directly or indirectly stated his anxiety and contempt. Trump, on his twitter, criticized that the airplane was difficult to operate. Then again, that the older models were more reliable and easier to use. He also stated that the new change in the airplane did not offer the necessary upgrades. For example, the complexity of the system does not benefit safety. He implied that on the newly designed plane, more pilot skill is needed. The FAA later declared that the model 737 would be suspended by an investigation. The series of orders put Boeing in an embarrassing situation. When the air crash first happened, Boeing did not show their responsibility, at least publicly. What may make the situation even worse is the tariffs on iron and aluminum. One year ago, Trump decided to raise the taxes on iron and aluminum up to 25%. Boeing began to lose the advantage in price. Even though clients still showed their interest in Boeing’s aircrafts, its opponent, Air Bus, will inevitably take advantage of the situation and capture market share that used to belong to Boeing. The slow decline in the stock indicated the market did not hold a favorable view of Boeing. From March 8th, the stock price has dropped from $422 to $343. Keep in mind, March 9th and 10th were weekend days where the stock market was closed. Soon, if the result of investigation shows that Boeing should compensate for the loss, then Boeing’s stock price will drop more significantly. Boeing is a global company where the supply chains span the entire world. The 737 Max is the model that Boeing highly depends on for future revenues. If the 737 Max are all suspended then perhaps all attached industries, such as aluminum and oil, may face declines in the next few years. Xiangqi Ling is a Graduate Student studying Financial Mathematics at North Carolina State University. 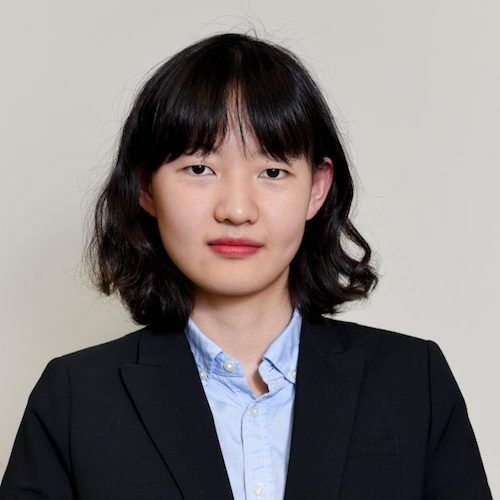 She possesses deep interest in quantitative analysis, machine learning, statistical modeling, financial risk management, CECL (credit risk) including regulations, methodology and model validation, etc. ; and can be connected on xling5@ncsu.edu or https://www.linkedin.com/in/xiangqi-ling/. Article by Alex Tunnell, candidate in Master of Financial Mathematics (Dec 2019). As students of Financial Mathematics, we are exposed to various topics. Finance, programming, mathematics and statistics are the pillars of the program. We also engage in projects and workshops to enhance our employment prospects. Additionally, we invite leaders from industry to speak with us, so that we may be better prepared for future interviews and life in general. One such speaker we had was none other than Dr. Paul G. Staneski. He has decades of experience spanning from academia to work as a quant at O’Connor. He was also a Managing Director in Equities and Head of Derivatives Solutions & Training at Credit Suisse. He now operates his own education and consulting firm: Derivatives Solutions LLC. Dr. Staneski imparted invaluable information and taught us how to Survive and Thrive in a Wall Street Interview. Before the interview, one should know general economic information, such as the chairman of the Fed and unemployment/inflation rates. Researching the company and understanding the position you are applying for is key. In addition, it is vital that we can explain and elaborate on every topic that we have on our resume. Impressions are very important, therefore proper etiquette and clothing are a necessity. He also emphasized that we should avoid waring green or brown suits. Also, black suits are discouraged unless one is interviewing for an undertaker position. During the interview, one must be poised and ready to handle ridicule. It is not uncommon for the interviewer to be rude in an attempt to see how we conduct ourselves under pressure. In addition to practicing generic interview questions, Dr. Staneski advised us to prepare for questions that require some thought, such as: How many pennies does it take to make a stack as high as the Eiffel Tower? It is important to remember that “Good answers are thoughtful, clear, interesting, confident, and relevant (and not too long!)”. After the interview, he advised that it’s best to send a thank you letter to the interviewer. Although it may seem old fashioned, it is still impressive and will not hurt our chances of receiving an offer. II found Dr. Staneski’s insight and advice very helpful. I plan to stop waring my black suit to interviews and will also practice answering thought provoking / brain teaser type questions. Article by Pengfei Xiong, candidate in Master of Financial Mathematics (May 2018). After President Trump followed through on the tariffs recommended by his commerce department – taxing steel imports at 25% and imported aluminum at 10% – the global stock markets took a sharp downturn on March 1st, 2018, over fears of a trade war between China and the US. The Dow Jones dropped 420 points, while the NASDAQ and the S&P 500 declined 1.3% apiece. On April 2nd, China struck back, imposing tariffs on US imports worth around $3 billion – including a 15% duty on 120 American products. On April 3rd, the US responded, proposing a 25% tax on close to 1,300 Chinese goods, including the aerospace, machinery and medical industries, worth around $50 billion. Chinese government announced another set of retaliatory tariffs one day later, nearly matching the proposal by the Trump administration – a 25% tariff on a variety of products from the US worth $50 billion. Wall Street’s concerns over a trade war did not last long, as the Dow recovered a 510-point loss on Wednesday, April 4th, and closed with a 230-point gain. According to estimates released on March 29th by the Bureau of Economic Analysis, gross personal income increased by $67.3 billion (0.4%) in February. Personal consumption expenditures (PCE) increased by $27.7 billion (0.2%) and disposable personal income (DPI) increased by $53.9 billion (0.4%). The US Census Bureau and the US Bureau of Economic Analysis announced the goods and services deficit was $57.6 billion in February – $0.9 billion higher than in January. Exports in February were $3.5 billion more than in January, which were $204.4 billion. Meanwhile, imports were $262.0 billion, $4.4 billion more than in January. Note: Please note that this report is an excerpt of the report presented to the CFA Equity Research Challenge. The original report was modified for the purpose of fitting it into this journal. Any reader who wishes to read the actual report may contact the above team members at Financial_Mathematics@ncs.edu. PRMW provides multi-gallon purified bottled water, self-service refill water and water dispensers in the United States and Canada. Over the past year, Primo has seen the retirement of CEO Billy D. Prim and CFO Mark Castaneda. These individuals were pivotal to the success and marketability of PRMW’s water exchange and refill business. The future prosperity of the company will depend on the strength of management by interim CEO Matt Sheehan and CFO David J. Mills. Primo acquired Glacier in January 2016 which surged their business financially. Under this merger agreement, the company paid $200.2 million to Glacier’s equity holders. The company believes that this acquisition helps in diversification of their retailer base and offers shared service synergies. Primo Water Corporation (Nasdaq: PRMW) was founded in 2004 and is headquartered in Winston-Salem, North Carolina. Together with its subsidiaries, it is a single-source provider of multi-gallon purified bottled water, self-service refill water and water dispensers through major retailers in United States and Canada. The company follows the “razor-razorblade” business strategy – the sale of their water dispensers creates a recurring demand for their purified bottled water or self-service filtered drinking water. In December 2016, the company acquired “Glacier Water Services, Inc” – considered a leading provider of high-quality drinking water through self-service machines located in super markets and other retail locations. Primo’s products are offered at over 46,000 retail locations combined in United States and Canada including retail giants such as Lowe’s Home Improvement, Walmart, and The Home Depot among others. PRMW operates under two reporting segments: Water and Dispensers[I]. Their “razor-razorblade” business model aims at selling an initial product which further leads to a user base who frequently purchase complementary consumable products. Once their bottled water is consumed using a water dispenser, either the empty bottles are exchanged for the purchase of a new bottle at recycling stations (commonly referred to “Exchange”) or they are refilled at a self-service filtered drinking water location (commonly referred to “Refill”). Primo’s marketing efforts focus primarily on developing and maintaining a brand identity synonymous with an environmentally friendly, economical, convenient and healthy solution for purified water consumption. Their marketing efforts include the following initiatives: (i) prominent display of various brand logos and designs on water bottles, sales and recycling displays and water dispensers; (ii) recycling center displays and prominence “billboards” and; (iii) social and digital activation [II]. The company places great emphasis on continuing to develop and sell innovative water dispensers at attractive retail prices. As of December 2016, PRMW offered water dispensers at approximately 7,500 locations in US and Canada including major retailers like The Home Depot, Lowe’s Home Improvement and Sam’s Club [I]. As of December 2016, PRMW offered water products at approximately 46,000 retail locations including over 20,000 obtained from the acquisition of Glacier. The company believes there is minimal overlap where Exchange and Refill are offered and there is virtually no overlap between Primo and Glacier locations, thereby diversifying their retailer base. The company plans to increase retail store locations (including new locations with their existing retail customers) within their primary retail categories of home centers, convenience stores, hardware stores and membership warehouses [I]. The growth and success that PRMW has experienced can heavily be attributed to its executive leadership. Before founding Primo in 2004, Billy D. Prim founded the Blue Rhino Corporation in March 1994, a propane cylinder exchange service using the “razor-razorblade” business strategy. As executive chairman, Mr. Prim’s experience and insight have been invaluable. Primo’s president and CEO, Matt Sheehan, has a great amount of experience in exchange businesses. Before joining Primo, Mr. Sheehan held positions in the Sales and Business division at Redbox, a popular movie and video game exchange service. Redbox machines are located at many of the same locations that PRMW offers its services. In January 2018, David J. Mills replaced Mark Castaneda as the Chief Operating Officer of PRMW. Mills has previously served as the President of Finance and Treasurer at Primo [XV]. The soft-drink beverage industry consists of non-alcoholic liquid refreshment beverages such as bottled-water, carbonated soft drinks, energy-drinks, fruit beverages, coffee and tea [IV]. The industry’s market size was approximately $967.3 billion in 2016 and is expected to grow at 5.8% CAGR to $1.6 trillion by the year 2025 [VII]. This market is driven by consumer preferences, changing lifestyle, demand through growing population and increase in high disposable income [VI]. Increased awareness towards a healthy lifestyle is acting as a biggest driver for this industry. The industry has experienced a change in orientation from carbonated soft drinks to low-calorie beverages. However, stringent government regulations for labeling, listing the ingredients etc. in developed countries are expected to restrain market growth. There has been an increasing trend towards living a healthier lifestyle. Research has proved that obesity is linked to higher consumption of carbonated drinks. This has led to the development of calorie-free or low-calorie drinks such as bottled water and fruit beverages. Recent incidents such as the Flint, MI lead contamination crisis have impacted consumer confidence in the quality of municipal drinking water and led to an increase in the purchase of bottled water. There has been an increase in the sale of products with a lower environmental impact as a result of a shift in consumer behavior favoring environmental sustainability. Most single serve polyethylene terephthalate (“PET”) water bottles are produced using fossil fuel and contribute to landfill waste. According to the report by The Association of Plastic Recyclers, the total plastic bottle recycling collection rate was only 29.7%, a decrease of 1.4% compared to 2015 [I] . According to a report by market research and consulting firm, Beverage Marketing Corp., bottled water surpassed carbonated soft drinks to be the largest beverage category by volume. This new data confirms a decade long shift in consumption habits from soda to water driven by health concerns [V]. Primo’s water segment promotes the reuse of existing bottles, recycling of water bottles when their life cycle is complete, and reduction of landfill waste and fossil fuel usage compared to alternative methods of bottled water consumption [II]. As a smaller company in a soft drink beverage industry filled with leading companies in consumer products, PRMW has minimal market positioning. Some of its closest competitors, including The Coca-Cola Company, Dr. Pepper Snapple Group, Nestlé, and PepsiCo, have larger funds to invest, a diverse set of products in which they can mitigate risk, and significant brand recognition. Revenue of the above listed competitors were at least 45 times higher than Primo’s revenue in the past fiscal year [VIII]. This gives said companies, flexibility for future investment prospects and acquisition in the ever-growing water industry which PRMW may not be able to materialize. Primo has a large network of department stores, hardware stores and gas stations in the U.S. and Canada. Their distributors are well known conglomerates such as Walmart, Lowes, and Kroger which provide a convenient method of refill and exchange. With the acquisition of Glacier, this network is arguably the most dominant within North America for water service goods. Nestlé, PRMW’s largest competitor for 3 and 5-gallon water bottle exchange business, operates only in select regions in the United States. PRMW has three lines of products: Refill, Exchange, and Dispensers, each product encountering varying levels of competition. Primo’s refill business experiences competition from companies such as Vekyen, Watermill Express, and U-Fill Water. We believe that the company’s third line of business – dispensers, faces the highest level of competition. The dispenser industry is filled with long-standing companies such as Culligan, Elkay, Whirlpool, and Igloo. The business strategy of PRMW has depended heavily on the “razor-razorblade” system. For Primo to receive the high margins from this line of business, they must differentiate the dispenser business from possible competitors in order to increase sales. Generally, Primo has no comparative advantage which creates a barrier for competitors coming into the water distribution and exchange market. Any company could underscore PRMW’s profits by creating business relationships with national department stores which do not currently have reverse osmosis filtration systems installed. However, Primo has sustained healthy relationships with such companies as Walmart, Sam’s Club, and Circle K which work at a national level. The retirement of the CFO Mark Castaneda brings up concerns regarding the management that could affect PRMW negatively. There is uncertainty about David J. Mills, and whether he will perform as well as Castaneda. In addition, with the acquisition of Glacier we are unsure if there will be impactful further changes in corporate governance and management. PRMW is not as widely known as some of its’ peers. They require a stronger marketing presence in order to grow awareness of their products. Even targeting a niche market, the company has the second lowest market capitalization among its peers. From our valuation methodology the target price for PRMW is $16.71 resulting from a combination of relative and intrinsic valuation. Primo’s main revenue comprise of the water and dispenser business segments and require equal consideration. We valued each of them based on both historical performance and future operational planning. The financial modelling exercise was based on publicly available information and Primo’s press release and conference call. Furthermore, the DFCF model was implemented to get Primo’s enterprise value. For the DFCF implementation, we performed a segmented revenue forecast. It is important to notice that PRMW made an agreement with DS Service of America from 2016 until 2025 – it is assumed that they will continue generating revenue on this stable relationship. The company got a coherent increase in their dispenser units, as well as in water. The growth rate of dispenser units was approximately 15%. We assumed that they will maintain this growth level in the future. As for their water revenue growth, they benefited from the acquisition of Glacier in 2017. 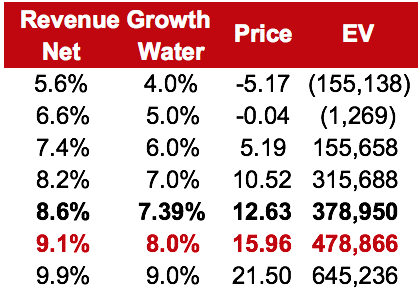 We conducted a sensitivity analysis on the target price with respect to the growth in water revenue, to understand how the price changed with respect to the sales. In the analysis, our water revenue growth rate varied from 4% to 9%, which resulted in total revenue growth rate changing from 5.6% to 9.9%. 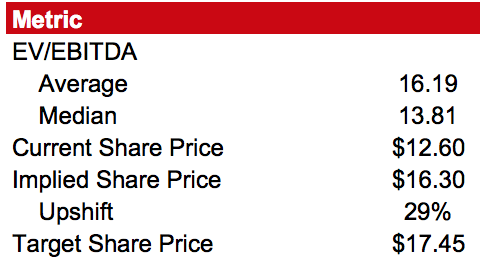 As we can see in the figure above, the share price is quite sensitive corresponding to the revenue change. With a 5% change in revenues, we obtained approximately a $27 change in price. According to this analysis, if the growth rate is under 7.4%, Primo will suffer from lack of cash flows to pay their debt obligation; resulting in a negative enterprise value, as well as share price. If they want to keep the share price the same as today, Primo should keep their revenue growth rate at 8.55%. Furthermore, our target price is more sensitive on cost of equity than cost of debt; cost of equity at level of 12.6% will result in a target share price of $12.63. 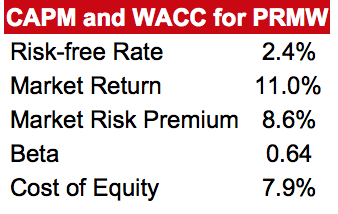 To get a fair value of PRMW, WACC was calculated based on the Capital Asset Pricing Model (CAPM) to reflect the required return of company’s capital. We used the yield of the US Treasury bond (10-year) as our risk-free rate. Due to the new tax act, the tax rate is 21%. Since Primo is a relatively new corporation, it is hard to get a consistent beta. Therefore, we analyzed its peer companies’ beta and used their median as a levered beta. Furthermore, the 5 years S&P 500 index average return (10.99%) was considered as the market’s return. The cost of debt is adjusted with Aswath Damodaran’s [III] estimation cost of debt for the whole industry. Assuming Primo’s business will be a perpetuity and it will be a mature company, we used a terminal growth rate model for estimating the company’s terminal value. Soft drink beverage industry can be considered as mature in the US market. We selected peer companies and used the EV/EBITDA multiple to perform relative valuation. A number of reasons supported our choice of using EV/EBITDA as a multiple. First, it is not influenced by the structure of the company and therefore the industry EV/EBITDA can be applied to PRMW. Second, the most common multiple Price-to-Earnings (P/E) ratio could not be used since the company’s high debt level and high level of expenses in recent years resulted in a negative net income. As can be seen from the peer evaluation figure, soft drink beverage industry has a wide range of P/E ratios. The estimated P/E for Primo highly deviates from the industry median. However, the impact on EV/EBITDA is relatively small. We achieved a target price of $17.45 from the relative valuation exercise. Our final target price is $16.71, considering both relative and intrinsic valuations. PRMW has registered high revenue growth rates in the previous years, with an outstanding rate of growth in 2017. As this growth rate was associated with the acquisition of Glacier, expecting a high growth rate for 2018 might be unrealistic. It is important to notice that the acquisition resulted in a structural change for the sales of the company which affected all financial figures. From the segmented sales, we know that Primo has been producing more accessible dispensers through the years that resulted in a rise of the units sold. Additionally, the company has registered a stable growth in the gross profit margin. We expect this tendency to continue in the near future. A positive tendency in the net cash provided by operating activities was registered in previous years. PRMW has a moderate rate of investment, funds allocated mainly into property and equipment (P&E) and bottles. The acquisition was financed by entering into a credit agreement with Goldman Sachs maturing in 5 years. Furthermore, Primo is a highly indebted corporation, with liquidity in the future as a main concern. The quick ratio dropped after the acquisition, resulting in higher pressure from selling current inventory to fulfill obligations. 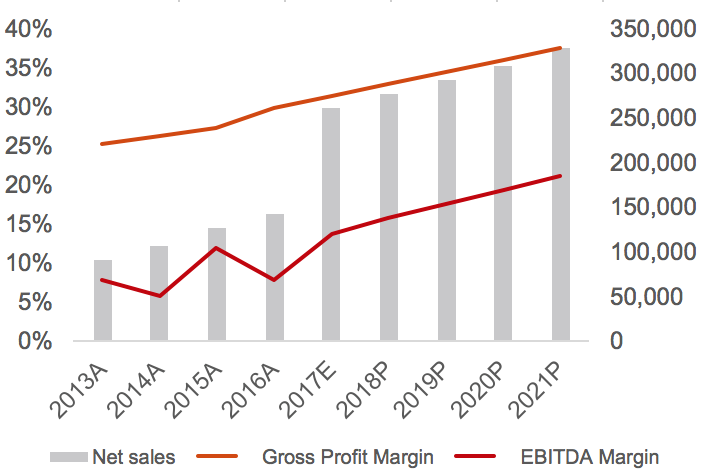 In the figure related to Sales, Profit and EBITDA, we see a fluctuating margin of EBITDA over previous years. We expect the margin to increase driven by the strong revenues. Our projections indicate that Primo will be collecting cash, resulting in a reduction in 2021 when they will face the final payment to the credit facility. PRMW’s historical financial figures have not been affected by inflation and changes in prices. Nevertheless, the quarterly-granular figures suffer from seasonal fluctuations. A positive tendency of reducing the margin of sales for both selling, general and administrative expenses (SG&A) and accounts payable have been registered. On the other hand, the margin of accounts payable to cost of goods sold has remained stable. Regarding cash cycles, it is important to notice that Primo has increased the cycle for accounts receivable from approximately 30 to 37 days. The company cannot increase this cycle again. However, it might be in the position of reducing it back to 30 days in the future. Adjusted EBITDA has been used previously by Primo as a KPI for the management of the corporation. We can notice in the table below that the growth has been fluctuating. We expect PRMW to increase its Return on Equity and Assets, (ROE and ROA respectively), given the fact that they have to face strong financial obligations. Regarding the ROE and ROA history, it is important to keep into consideration that Primo is a relatively new corporation – they have been investing, trying to expand their operations. Although Primo has good working relationships with large retailers, the proportion of revenue gained is highly imbalanced. 74% of PRMW’s net sales come from its three largest retail customers [I]. 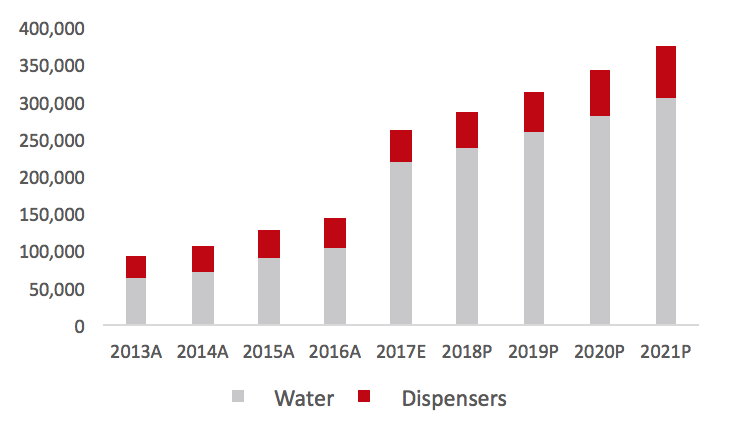 One of the company’s largest key drivers is to penetrate a larger percentage of households with its line of dispensers. In doing so, Primo hopes to produce a loyal customer base in their refill and exchange businesses. This may be hindered by the suffering liquidity due to its debt obligation. DS Services of America, Inc. is Primo’s primary bottler and distributor of 3/5-gallon bottles. This is a strategic alliance which is not guaranteed to be extended after 2025. Customer’s inclination to accept primo’s “razor-razorblade” model. PRMW vehemently stands with its “razor-razorblade” strategy. Although a customer who purchases a dispenser will be more inclined to exchange or refill 3/5-gallon bottles at local retailers, this does not guarantee customer loyalty. If PRMW is unable to maintain sufficient cash flows to satisfy their debt, the company could have solvency issues. Current debt to equity (D/E) ratio for Primo is 4.74 which is significantly higher than before the acquisition of Glacier. The acquisition of Glacier has increased the size of the company significantly. However, Primo’s future growth is still uncertain. Forecasts made in anticipation of this acquisition may differ materially from actual financial position in the future. I.	Castaneda, Mark. “Financial Information – Primo Water Corporation.” Investor Relations – Primo Water Corporation, 16 Mar. 2017, ir.primowater.com/financials.cfm. III. “Damodaran Aswath. Costs of Capital by Industry sector”, http://people.stern.nyu.edu/adamodar/New_Home_Page/datacurrent.html. IV. Duncan, Eric. “Non-Alcoholic Beverages and Soft Drinks.” Www.statista.com, July 2016, www.statista.com/topics/1662/non-alcoholic-beverages-and-soft-drinks-in-the-us/. V.	Harvey, Charlene. 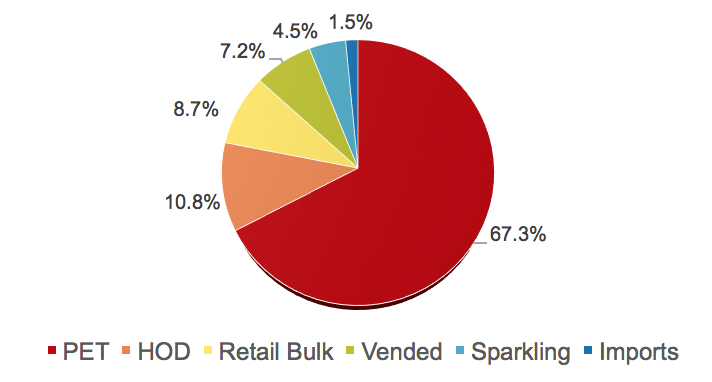 “Beverage Market Reports.” Beverage Marketing Corporation, 2017, www.beveragemarketing.com/. VI. Wood, Laura. “Global Non-Alcoholic Beverage Market Worth USD 2020 Billion by 2021 – Analysis, Technologies & Forecasts Report 2016-2021 – Vendors: Attitude Drinks, Coca-Cola, Danone – Research and Markets” Business Wire, 26 Nov. 2016, https://www.businesswire.com/news/home/20161116006250/en/Global-Non-Alcoholic-Beverage-Market-Worth-USD-2020. VII. Wood, Laura. “Global Nonalcoholic Beverage Market 2014-2017 & Forecasts to 2025 – Market to Grow from $967 Billion to $1.6 Trillion.” PR Newswire: news distribution, targeting and monitoring, 24 Nov. 2017, www.prnewswire.com/news-releases/global-nonalcoholic-beverage-market-2014-2017–forecasts-to-2025—market-to-grow-from-967-billion-to-16-trillion-300561511.html. VIII. “Revenue, EPS, & Dividend – Primo Water Corporation (PRMW).” NASDAQ.com, 2018, www.nasdaq.com/symbol/prmw/revenue-eps. backtest overfitting on out-of-sample performance.” (2014).